The International Commission on Groundwater (ICGW) is responsible for the advancement of the science of groundwater hydrology, including the scientific basis for groundwater resource assessment and groundwater management. It is also responsible for helping to bridge the gap between science and practice. A primary objective is to give greater exposure to valuable new technologies and methodologies that are useful in groundwater resource and water quality studies. This is accomplished through organized technology transfer activities and publications. The Commission discharges its responsibilities in three ways. First, it organizes and sponsors significant international and regional symposia. Second, it collaborates with other IAHS Commissions and with other scientific organizations, including the American Geophysical Union (AGU), the International Association of Hydrogeologists (IAH), and the International Ground Water Modelling Center (IGWMC). Third, it organizes working groups to develop reports which focus on new and important aspects of hydrogeology. These activities are frequently coordinated with the International Hydrological Program (IHP) of UNESCO. During its tenure the Commission plans to continue and emphasize areas in which it has traditionally been active, such as groundwater quality, environmental risk assessment and numerical modelling. In addition, it plans to develop new areas of emphasis, including innovative field and laboratory measurement techniques, advanced field data interpretation methods, characterization of heterogeneous media, and management of groundwater resources under uncertainty. Projects undertaken by ICGW have resulted in significant contributions as reports and IAHS Red Books. The Commission also played a major role in several IAHS conferences. Some 8 years have passed since the analysis of ICGW membership done by Past-President Mary Hill. We have revised the analysis of the international members of IAHS who manifested interested in the Ground Water Committee. We have requested IAHS the full list of members who expressed interest in the Ground Water Commission, updated at June 2016. The following figure shows the distribution of ICGW members all over the world. 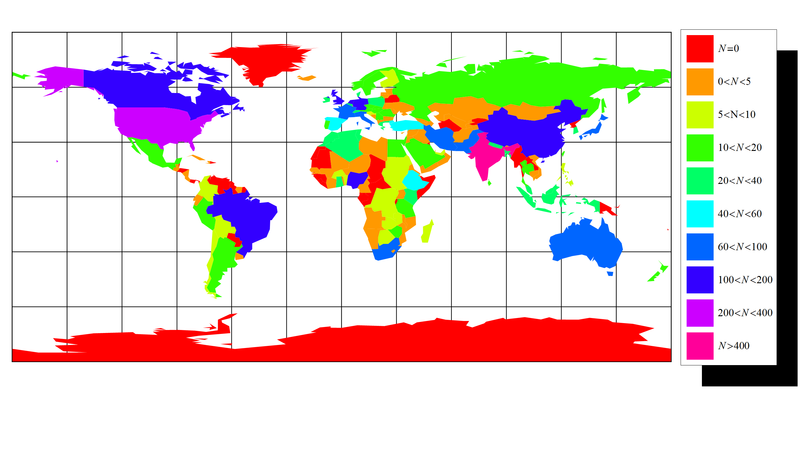 The figure clearly shows the wide distribution of members, with very few countries where ICGW is completely absent. Analysis of previous years memberships are available up to 2010. Figure 2 presents information similar to Figure 1, but showing the increase in membership by country for the period 2011-2016. Figure 3 shows the significant increase of members with interest in ICGW in Africa and Asia over the period 2011-2016. Figures 4-9 show the increase in membership between 2010 and June 2016 by continent and by country. Figure 2. 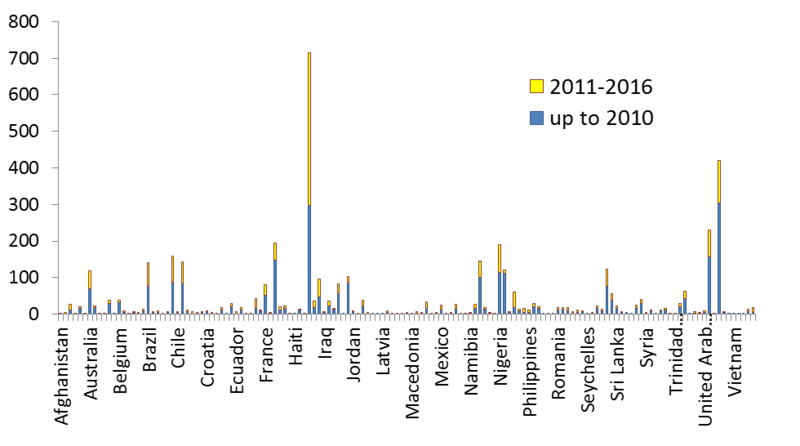 IAHS members who expressed interest in ICGW (updated June 2016): blue part of the chart represents memberships up to 2010 and the yellow part the new members for the period 2011-2016. Figure 3. IAHS members who expressed interest in ICGW by continent. Figure 4. 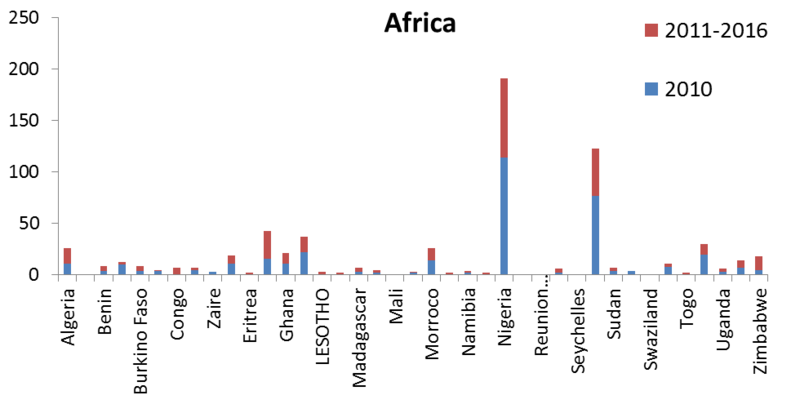 IAHS members who expressed interest in ICGW by country in Africa. Figure 5. 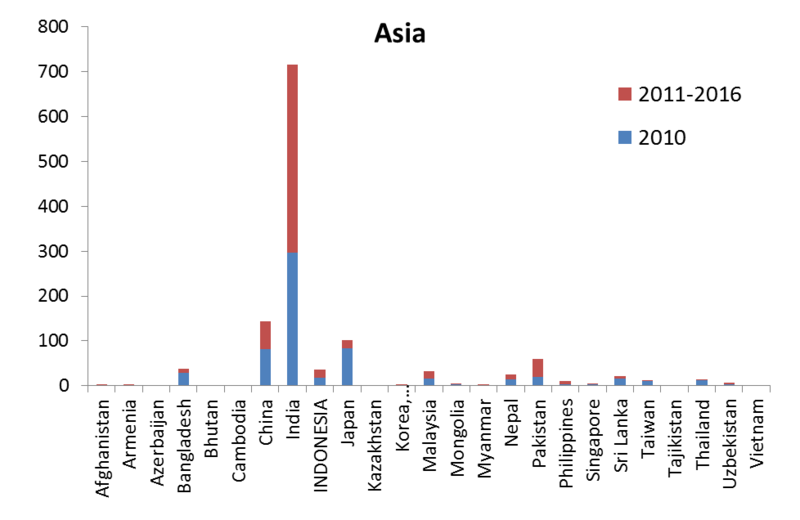 IAHS members who expressed interest in ICGW by country in Asia. Figure 6. 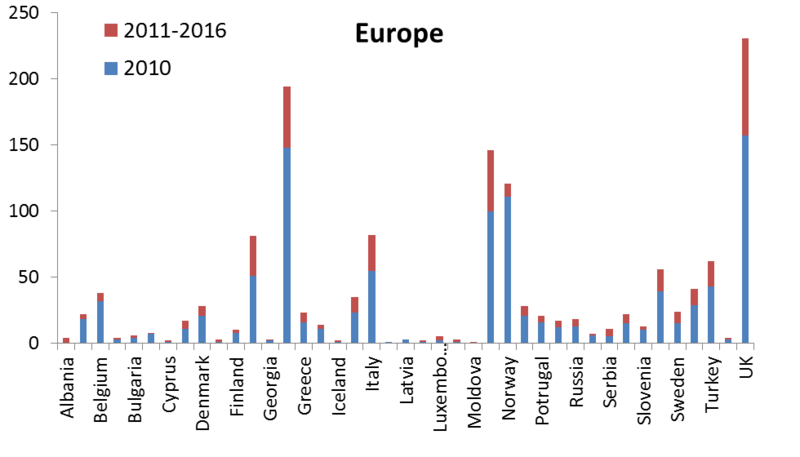 IAHS members who expressed interest in ICGW by country in Europe. Figure 7. 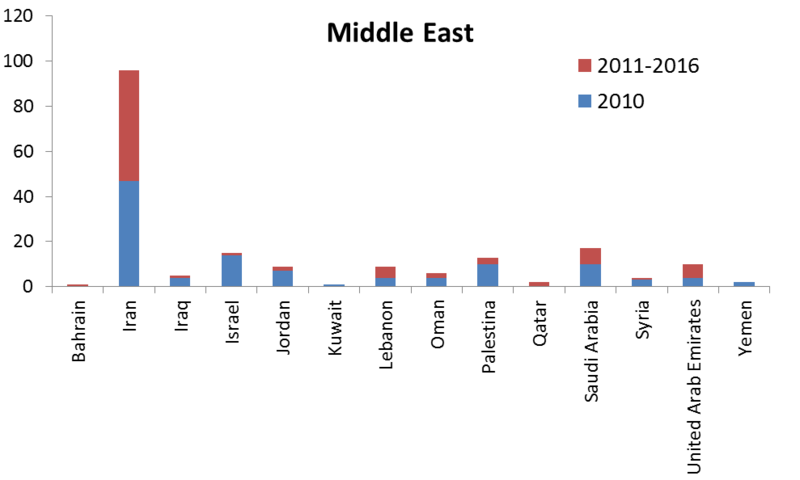 IAHS members who expressed interest in ICGW by country in Middle East. Figure 8. 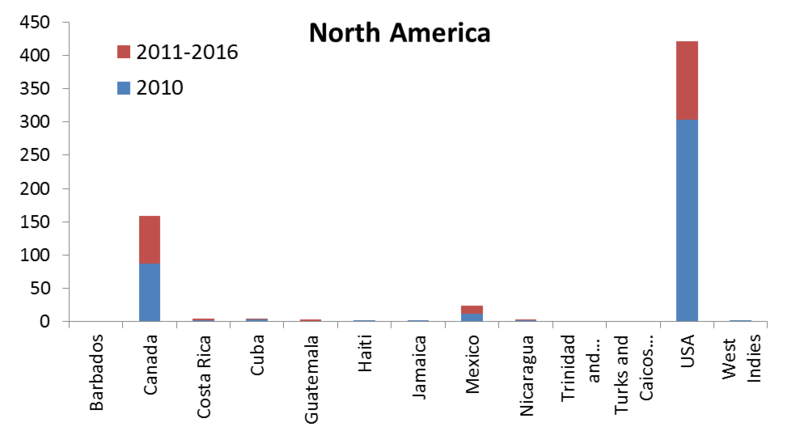 IAHS members who expressed interest in ICGW by country in North America. Figure 9. 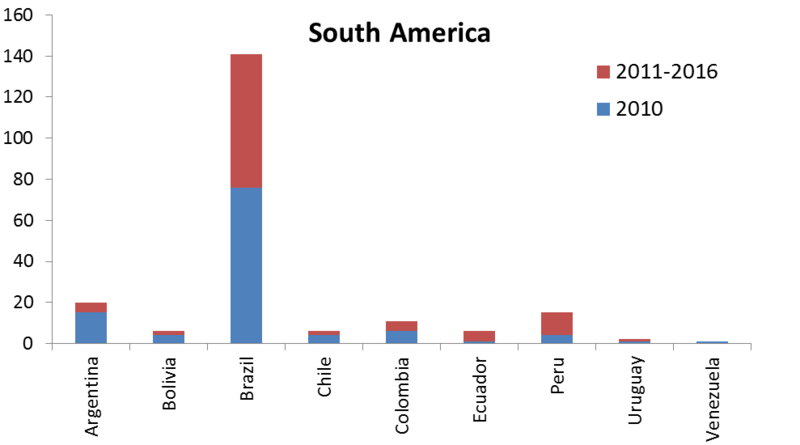 IAHS members who expressed interest in ICGW by country in South America. In September 2017, the FREEWAT consortium released a new plugin for QGIS to help the development of models to facilitate water resources management. More information and details are provided at the H2020 project webpage, www.freewat.eu, but here we summary the aims and goals of the project to demonstrate why this should be endorsed and supported by the ICGW. The FREEWAT platform has been developed in the framework of a HORIZON 2020 european project. FREEWAT is an open source and public domain GIS integrated modelling environment for simulation of water quantity and quality in surface water and groundwater with an integrated water management and planning module. FREEWAT aims at promoting water resource management by simplifying the application of the Water Framework Directive and related Directives. Specific objectives of the project are: to coordinate previous EU and national funded research to integrate existing software modules for water management in a single environment into the GIS based FREEWAT and to support the FREEWAT application in an innovative participatory approach gathering technical staff and relevant stakeholders (policy and decision makers) in designing scenarios for application of water policies. The open source characteristics of the platform allow to consider this an initiative "ad includendum", as further institutions or developers may contribute to development. Main expected impact of FREEWAT is to help produce scientifically and technically sound decisions and policy making based on data and innovative data analysis tools and to support participatory approach not only in the final stage of discussion but during the phase of scenario generation. 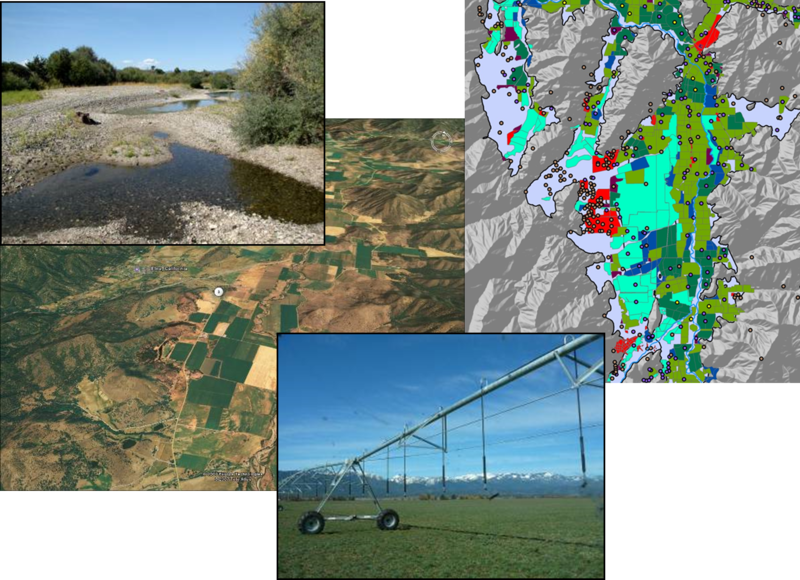 The platform currently includes specific modules for: 1) water management and planning to help managing and aggregating the distributed data coming from simulation scenarios; 2) calibration, uncertainty and sensitivity analysis; 3) solute transport in unsaturated zone; 4) crop growth and water requirements in agriculture; 4) tools for groundwater quality issues; 5) tools for analysis, interpretation and visualization of time series and hydrogeological data. The platform has been tested using test cases throughout Europe, one case study in Turkey and one transboundary aquifer between South Africa and Namibia. More independent testing is carried worldwide and the developers are gathering feedback.